Todays card is a complete lift of a card I saw in the Studio Calico gallery. I love, love, love this card. I admit it. I copied it and then gave it my own touch. You can find the card I was inspired by here. I love this card so much - I bet I will be making it many, many more times in the future. 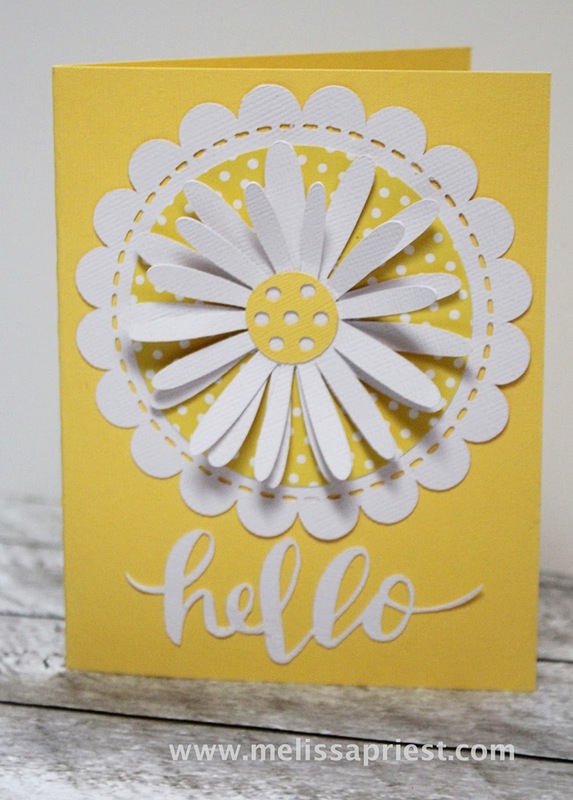 The flower, scalloped circle and 'hello' are all from the Silhouette store. The polka dot paper is from Lawn Fawn. To keep the 'hello' and the scalloped circle adhered, I used a spray glue. The daisy petals are only glued in the center using a basic glue dot. Since I only glued the center of the flower layers, I was able to give them some dimension by folding back, ever so gently, the flower petals. It just gives it a touch of whimsey. I see why you love this card, just looking at it makes me happy. Fantastic. Such a cheery card, Melissa. Love it! This is so very pretty. I like your spin on it. My favorite part is that you can mail it! No lumps and bumps for extra postage. This is so bright and happy. What a lovely card, perfect for the season.